Get in, readers. We're going shopping. There's a boot trend hitting up the sartorial circuit that's too striking to miss, and after one too many street style sightings, we knew it was time to give this shoe style its deserved moment in the spotlight. Thanks to the old Céline (RIP), the rise of dual-texture boots, both ankle and over-the-knee, has skyrocketed. Designers and fast-fashion retailers alike have taken inspiration from those famous boots and since churned out similar styles in their own iterations. Now, as we climb to the peak of fall 2018, it's been proven that these dual-texture boots are the sleek addition to your footwear collection you didn't know you needed. Sift through the boot section on any of your favorite e-commerce site and you will inevitably come across these multi-texture boots. The good news is whether you're looking to spend a pretty penny on a pair of investment boots or are just here for the short run and want a quick, trendy fix, the below boot selection will have you feeling satisfied in no time. Style the shoe trend with everything from jeans and a T-shirt or sweater (our favorite thing to wear our new ankle boots with) or, if the heel is formal enough, with a winter cocktail dress. Trust us when we say there's a reason these boots climbed their way to the top this season, so purchasing a pair of your own is in your absolute best interest. That geometric heel adds just the right amount of sparkle. For when you're tired of your all-black ankle boots. No one will ever guess these are under $100. Reike Nen is the go-to destination for unique footwear. 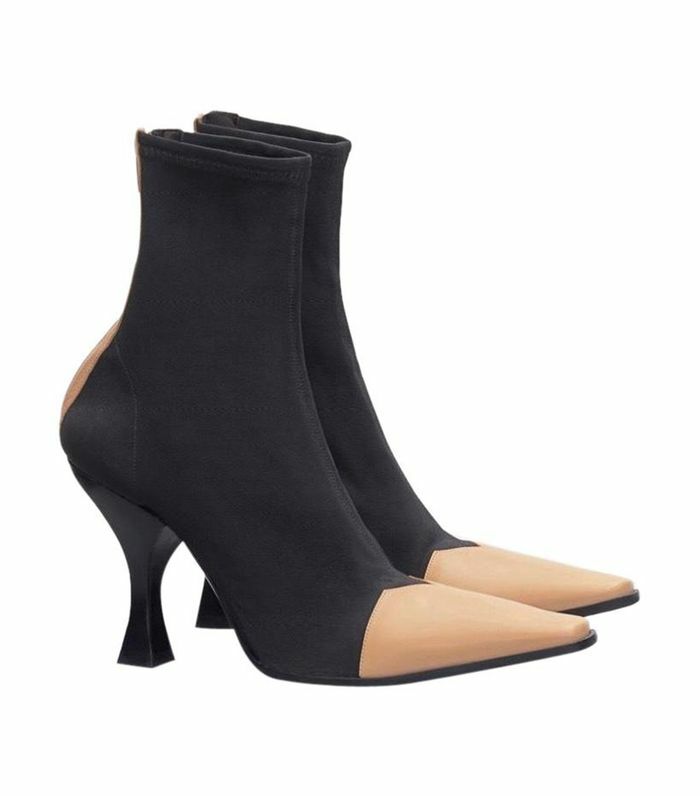 Wear these with a pair of black tailored trousers and a turtleneck. Another affordable version to tickle your fancy. The dual textures on these white boots make them feel ultra-luxe. This heel height will ensure you can walk around with no pain. Fendi giving us the blues yet again. Here are those Rag & Bone boots in black because they are just too good. A high heel for a special night. This brand just combined two of fall's biggest trends into one pair of shoes. These are elevated enough to wear to a cocktail party. These boots are back from the future. Please note the striking heel. A subtler sock-boot version in case you're not quite sold on the trend. Chunky heels are another way to ensure you'll be granted more comfort than not. Next up, shop the skinny jeans that sold out in 19 hours.